After the Watford striker called out Arsenal last weekend, the Gunners midfielder responded following a Europa League victory. ARSENAL MIDFIELDER JACK Wilshere has responded to Watford’s Troy Deeney, who said the Gunners lack “cojones” last weekend. Watford came back to defeat Arsenal 2-1 on Saturday, prompting Deeney to call out Arsene Wenger’s men for being soft. But on Thursday the Gunners had the perfect response to Deeney’s jab, as a late Olivier Giroud goal earned his side a hard-fought 1-0 win at Red Star Belgrade in the Europa League. 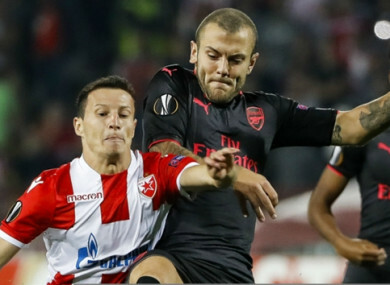 In aaddition, ahead of his side’s Europa League clash with Red Star Belgrade, Wilshere said Arsenal’s character should not be doubted. “As a player if your attitude is questioned, it’s horrible. I look around this team and you can’t question our character,” the England midfielder told a news conference. “People try to put us down, they always have. I don’t think the comments were justified. When we look back at the game we look back at ourselves and what we did wrong, I don’t think we can look back and question our character. “We did certain things wrong but we certainly didn’t want to let the lead slip. We will move on. We have a game [against Red Star] and another big game at the weekend and we have seen with this team that the players can bounce back quick and we will do that. “I’m sure individually the players are disappointed, no-one wants to hear those comments, [but] the players are entitled to their opinions and to talk, that’s part of the modern-day game. We have to deal with that. Arsenal are top of Group H in the Europa League, while domestically they face a trip to Everton on Sunday. Email “'I told you we have some' – Wilshere snaps back at controversial Deeney comments”. Feedback on “'I told you we have some' – Wilshere snaps back at controversial Deeney comments”.